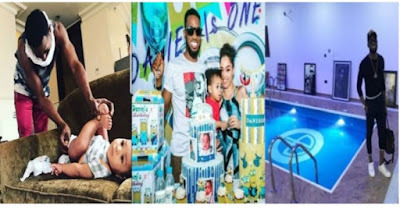 According to multiple reports, Dbanj’s wife, Lineo Didi Kilgrow has been placed on suicide watch after the death of their 13 months old son in Ikoyi Lagos. The beautiful woman has been left devastated with the death Daniel III is reportedly forcing people around her to take extra pre-cautions. According to a statement by the Lagos State Police Command, Dbanj’s home where the incident occurred has been locked with the wife reportedly grieving with her family or loved ones in the absence of Dbanj who is in the United States of Africa for the BET Awards. It would be recalled that a section of the Nigerian social media heaped blames on Dbanj and his wife over the preventable accident that led to the death of his son, Daniel. Pictured here is the indoor swimming pool where the only child of Dbanj, Daniel III drowned in his palatial home on Sunday, the 23rd of June, 2018 after he was left unattended to with no life jacket. The pool was also not hedged to serve as a barrier to any intruding minor. An inside exclusively told NaijaGists that Lineo Didi Kilgrow has been placed on suicide watch as she has been torn apart since the incident happened. Additional information has it that the light-skinned woman hasn’t stopped crying ever since.